Charles Johnson was a three-year letterman for the Hurricanes from 1989-92 and a first-team All-American by The Sporting News in his final season. Johnson made a quick impact at the University of Miami upon his signing with the Hurricanes in 1989. 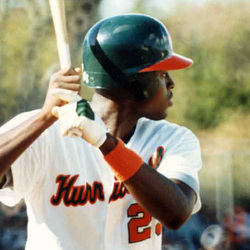 Johnson, a first round draft pick and 10th overall selection of the Montreal Expos, decided to forgo professional baseball to play with the Hurricanes. Johnson was an outstanding player from Fort Pierce Westwood High School where he was a three-time All-State selection and the Gatorade Player of the Year for the state of Florida in 1989. Those honors helped to make him one of USA Today's Super 25 players and earned him the distinction of being named the nation's best prep catcher by Collegiate Baseball. In his rookie season at UM, Johnson tied the freshman home run record with 11 to earn a selection to both the Baseball America and Collegiate Baseball newspaper Freshman All-America teams. Johnson eventually concluded his tenure at Miami as a two-time Golden Spikes Award finalist. In his final season with UM in 1992, The Sporting News named Johnson a First-Team All-American. As far as UM team awards, Johnson was a three-year recipient of the Home Run Trophy (1990, 11; 1991, 15; 1992, 12), two-year recipient of Most Popular by the Fans (1991, 1992), Rookie of the Year (1990) and Team MVP (1991). Upon leaving Miami in 1992, Johnson was once again drafted in the first round by his hometown Florida Marlins, but not before playing with the United States National Team at the Barcelona Olympics under his Miami Head Coach Ron Fraser. Johnson played with the Marlins from 1994 through 1998, before a trade sent him to the Los Angeles Dodgers during that 1998 season. He then signed as a free agent with the Baltimore Orioles, where he played a season and a half before joining the Chicago White Sox. Johnson returned home recently as the top free agent acquisition of the Marlins during the 2001 offseason. Johnson had his jersey number 23 retired on the outfield wall of Mark Light Stadium in a ceremony held during the Miami/Florida game on February 10, 2002.